our regular programs that will inspire, enchant and entertain young folks. 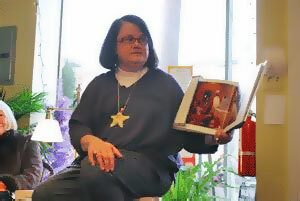 Sharon Wheeler, owner of Purple Crow Books, reads “The Polar Express” on Wednesday, Dec. 23, 2009. Wheeler said the reading was a way to say “thank you” to the community. Still, Wheeler said there was a way the children in the audience could make someone’s day. “I bet if you walk up to someone on the street and say, ‘Merry Christmas,’ I bet they’ll just smile and smile because it’s a gift,” she said.